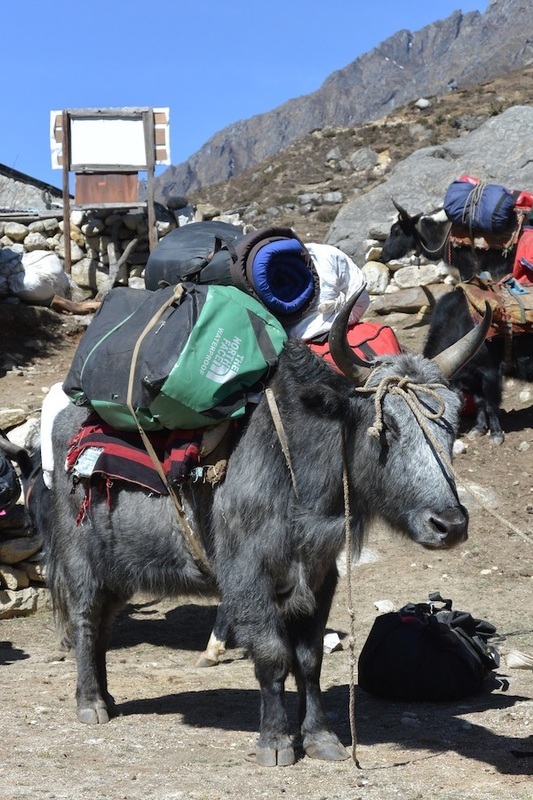 Left behind with the baggage! 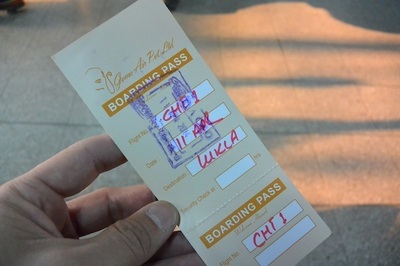 Waiting for the next flight. 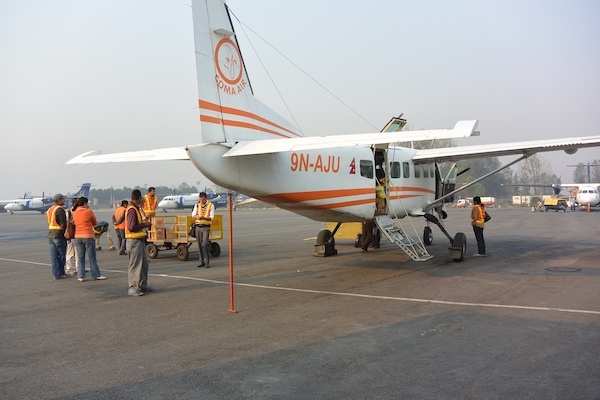 The next day Deha finally got us seats on a never before heard of airline with a fleet of one aircraft! 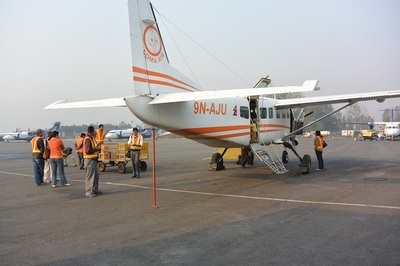 Goma Airlines, and in fact I looked them up only to discover they do not even have Lukla on their Destinations List! I've been up since 0430, its now almost 1500, we waited all day in the airport before Edward and I found the bar. A little beer and a quick nap. Our plane with propped up tail . 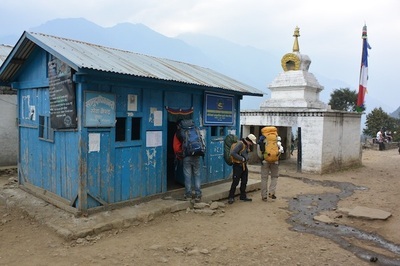 We got off and on the terminal bus several times as the unstable weather came and went, and then finally we got the go ahead to load up and attempt the flight with borderline visibility and approaching weather… not happy. Mohammad was especially terrified, and when we saw our aircraft we stopped teasing him about it. 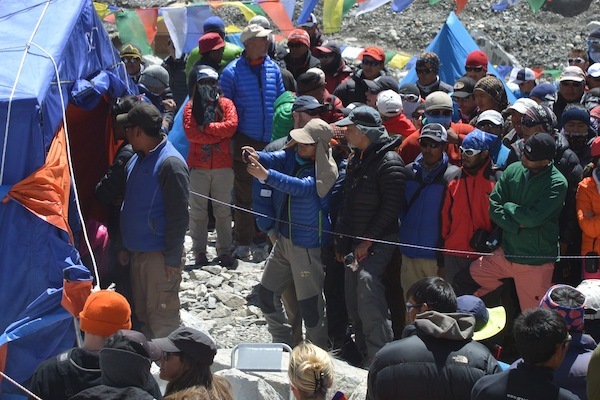 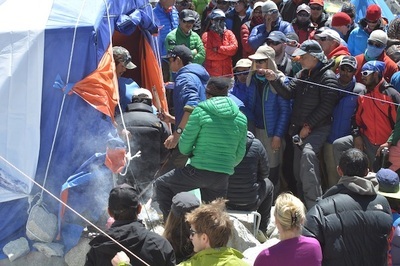 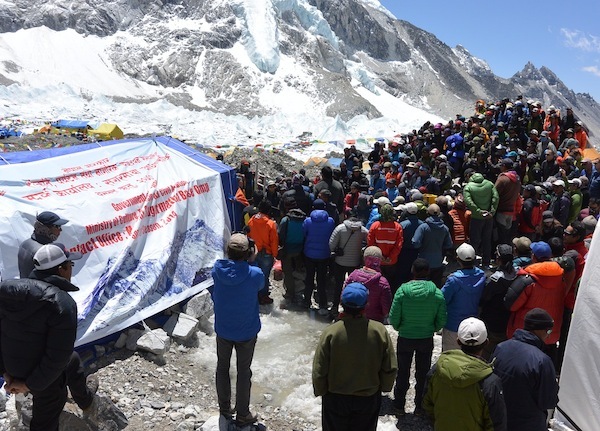 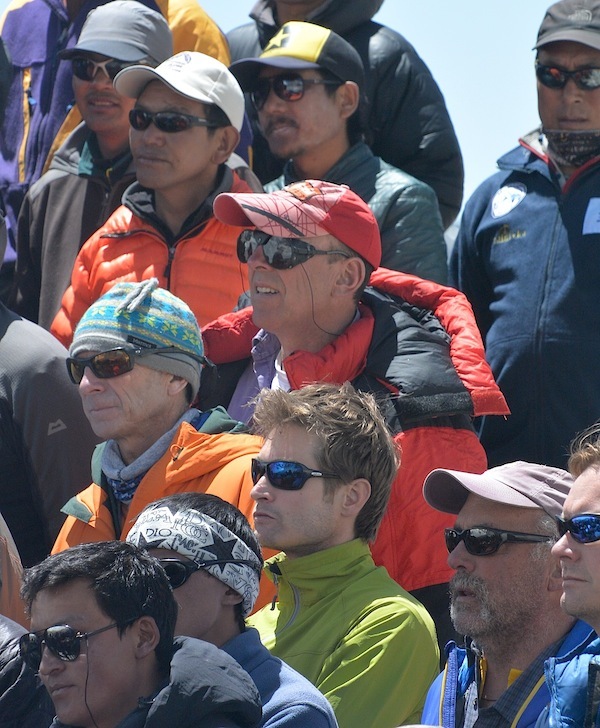 Even our experienced sherpas looked at their tickets and then looked up at the plane with hesitation. 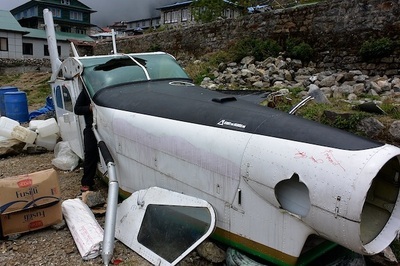 The tail was being held up off the ground by a metal rod because the back of the plane was loaded to the gills with gear, and it would have tipped back otherwise. Now, I might only have 2 hours in my pilots log, but I do understand the importance of weight distribution! 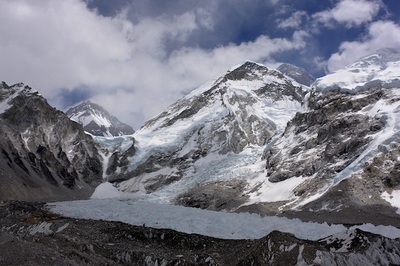 My view from the Jump Seat. We were carefully told where to sit, and I won the lucky seat right behind the pilots... thanks. 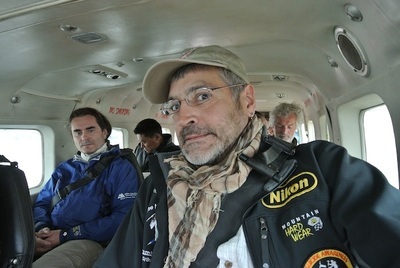 The capts door right in front of me was duct taped shut with a wood shim. 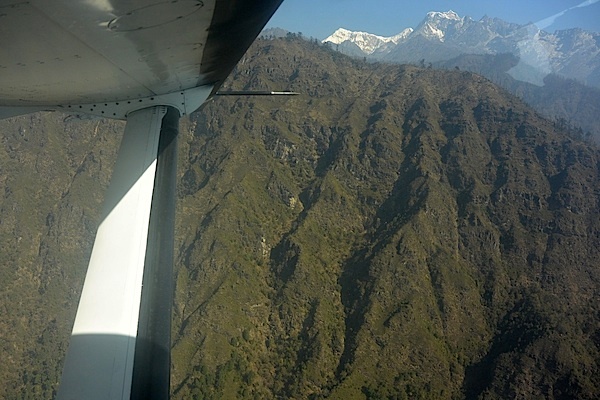 As we flew we weaved in between mountains that were much higher than our altitude, I found it a little uncomfortable when the pilots gave out a nervous giggle every time we squeezed through an opening. 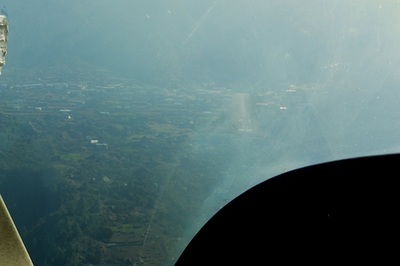 Approach to Airstrip... hazy line in the middle. 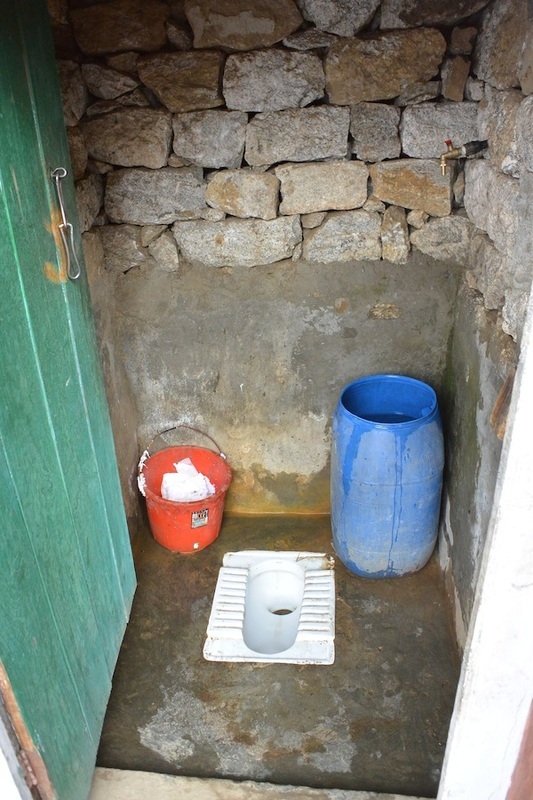 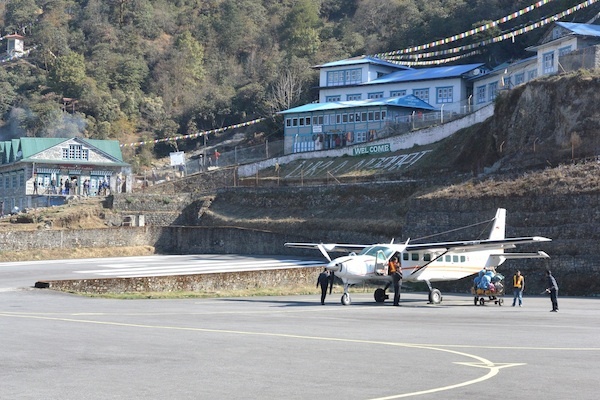 Here is what Lukla airport is like. It sits at 9383 feet with a runway only 1500 ft long. 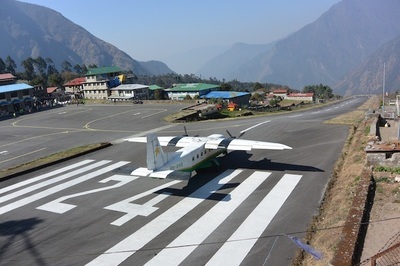 On the approach end of the runway there is a 2000 ft drop off and it runs up a 12 percent grade to the far end of the runway where there is a wall and a mountain. 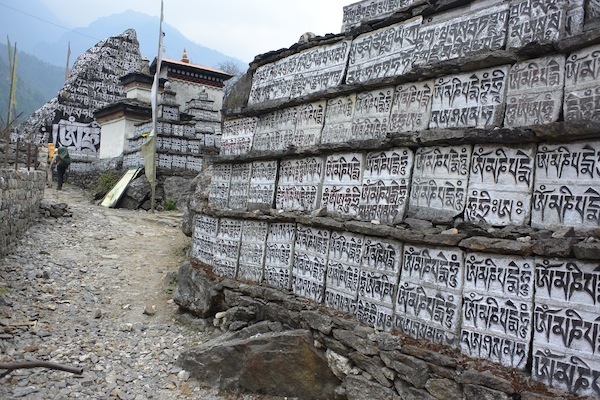 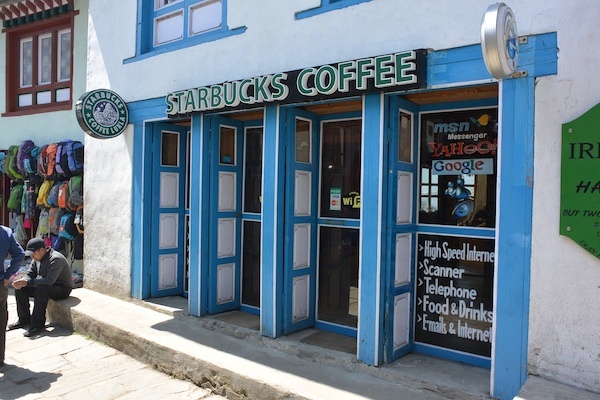 They were kind enough to paint “Welcome to Lukla” on the wall like some kind of target. You approach the runway aiming “up” and as soon as you touch down the pilot needs to come to an abrupt halt before smashing into the wall/mountain at the other end! 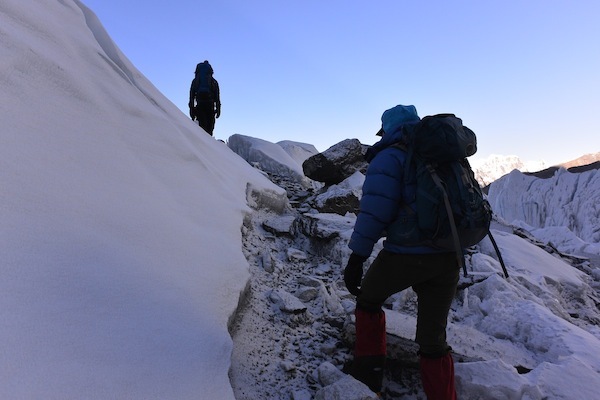 Once you commit to the approach there are no wave-offs, you have to land or crash. Take off is basically getting the plane positioned as far back against the wall as possible, revving the engine to max and popping the brake and the aircraft flies down the runway, lifting at the exact edge of the 2000 ft cliff! 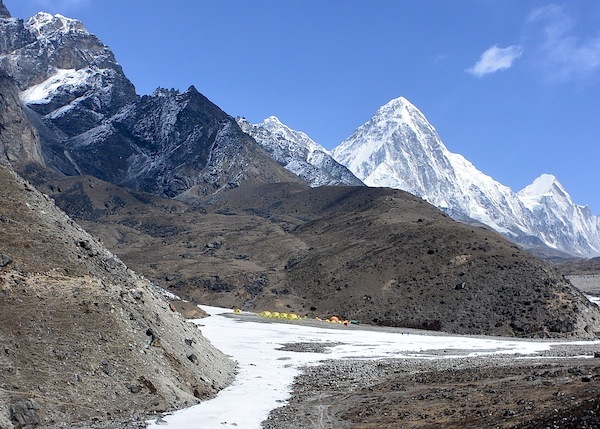 End of the Runway and theres a Mountain! 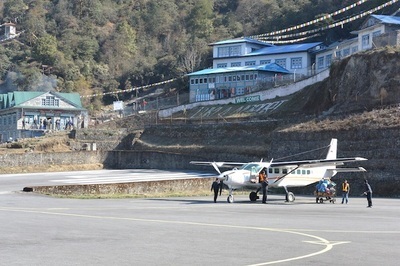 Taking off down the ramp! 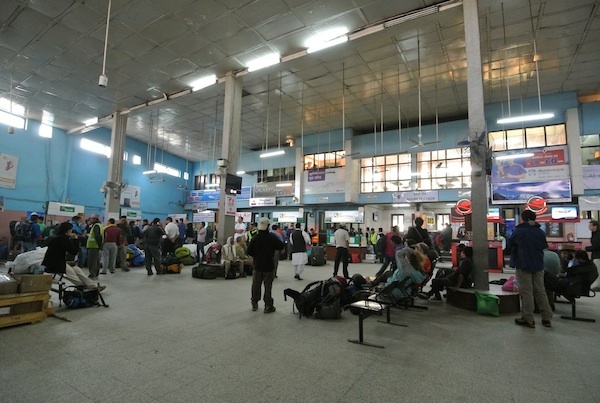 Waiting for our flight at KTM Airport. 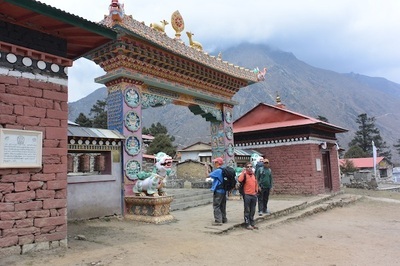 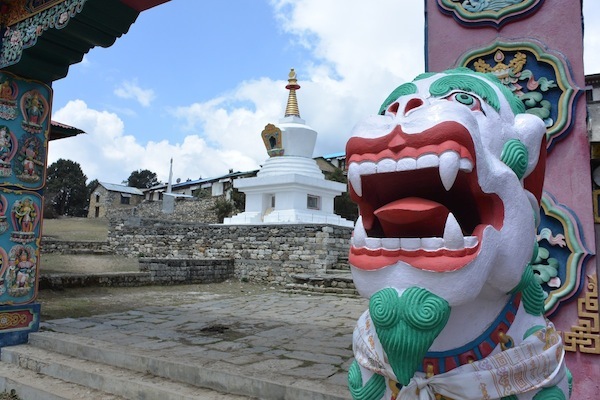 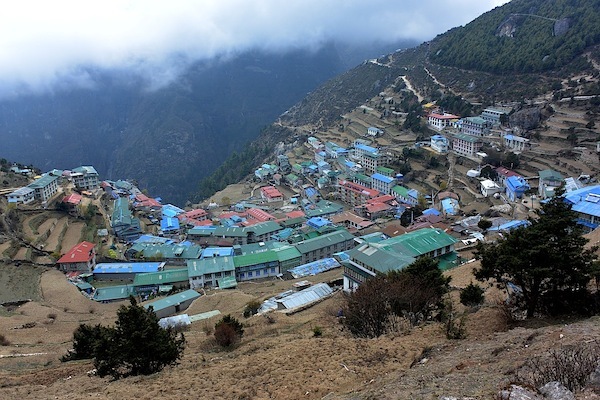 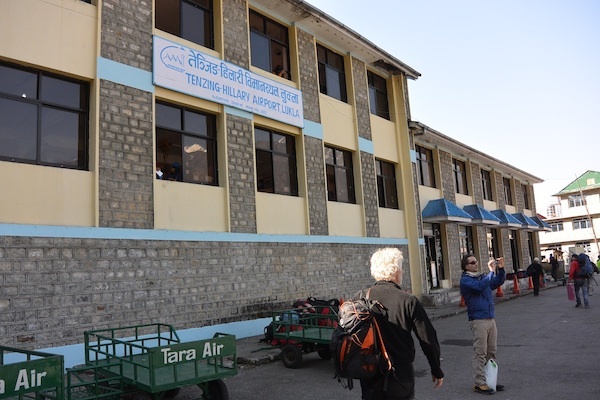 The dangers of mountaineering are many, but every South Col Everest trip begins with one of the most dangerous things you could ever do… fly into Lukla Airport, dubbed “THE” most dangerous airport in the world. 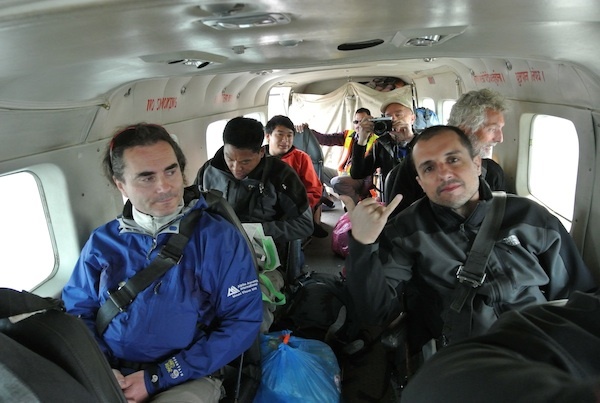 I’m not a big fan of flying to begin with, so you can imagine how much I enjoyed this flight! 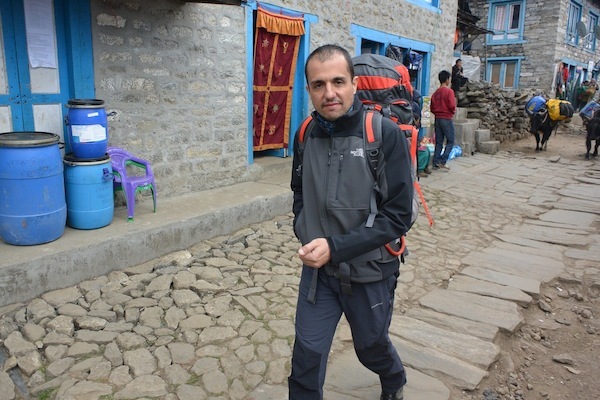 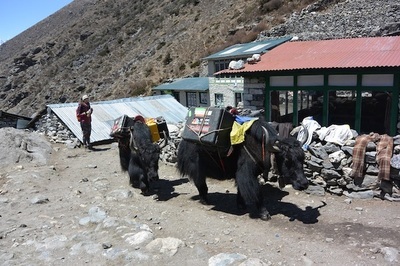 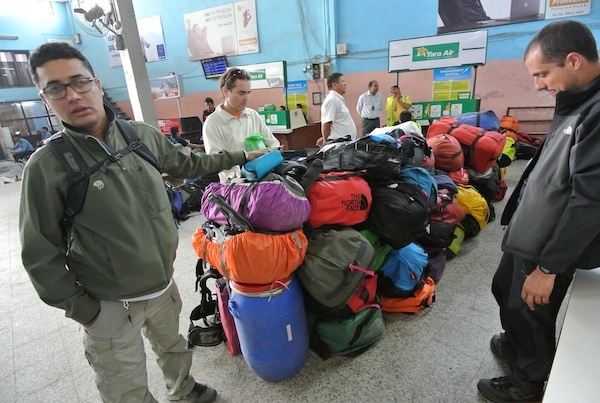 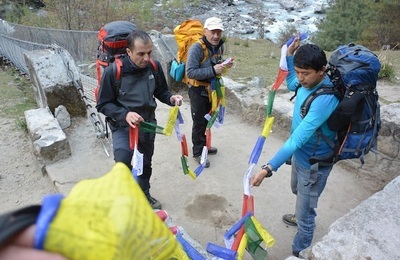 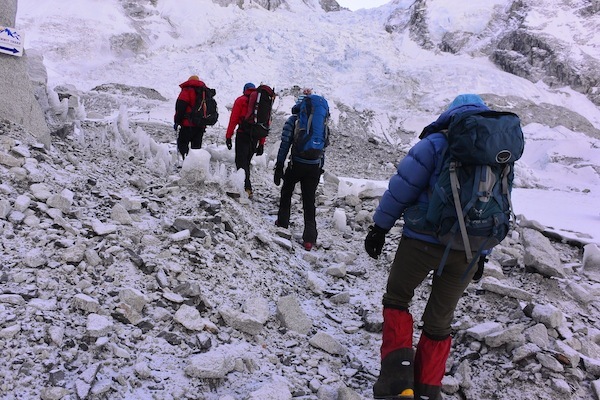 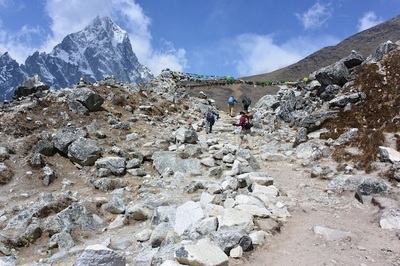 Most of the team made it off on the first two flights, but Mohammad, Karl, Edward, Carlos and I along with 2 sherpas were left behind with the baggage. 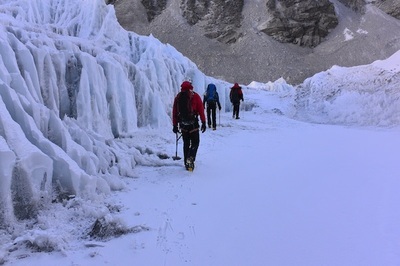 We spent all day waiting for an unreasonably narrow weather window and by late afternoon we were heading back to the hotel. 24 Mar 14: After months of planning, and expense I have been told I will not be allowed into Tibet to join up with my NE Ridge Expedition! 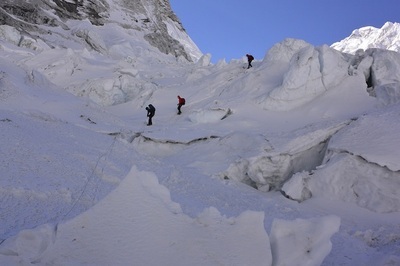 No fear, I have transferred to the South Col route from Nepal instead. 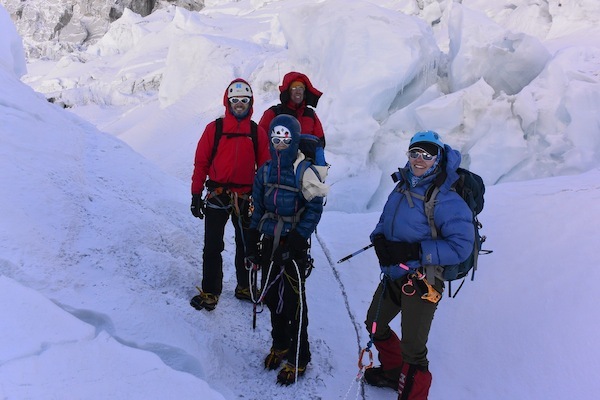 15 Feb 14: Me and the Zanowick Family at the Wright State Adventure Summit. 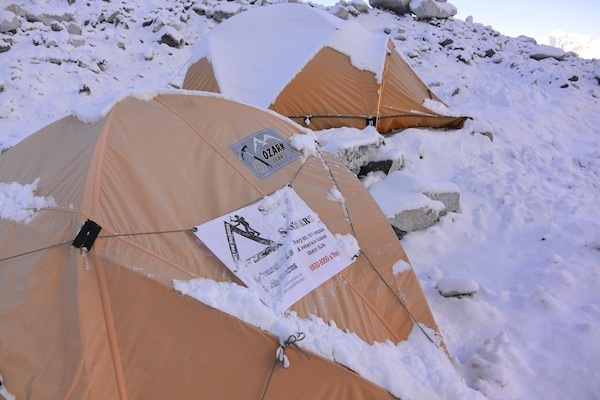 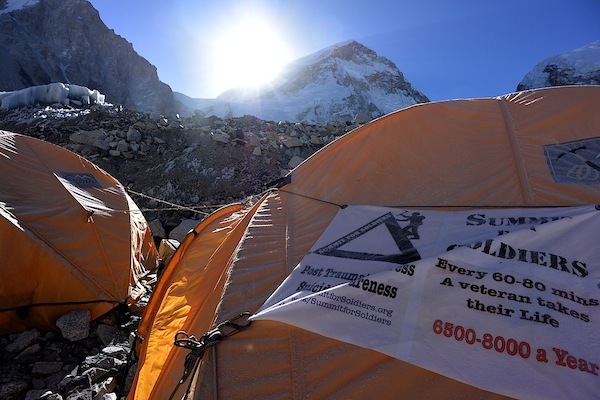 28 Jan 14: Our "Silently Fallen" flag raised on the summit of Aconcagua. 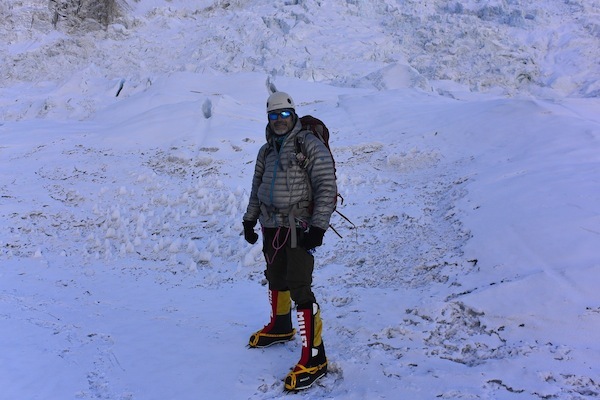 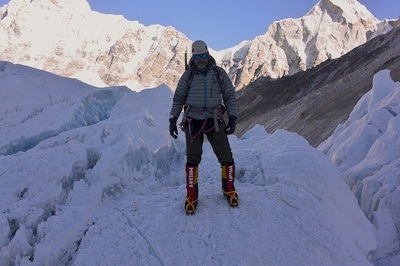 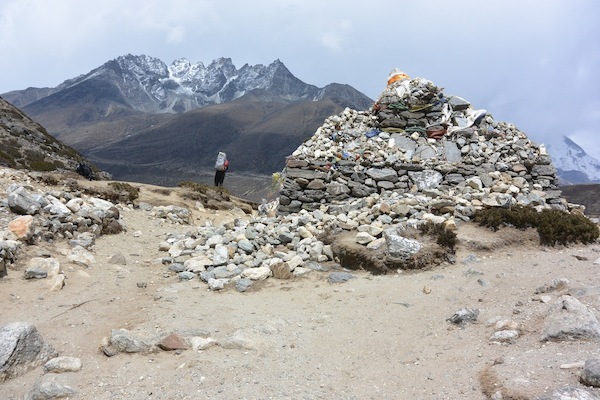 Everest training climb and the first of the Seven Summits. 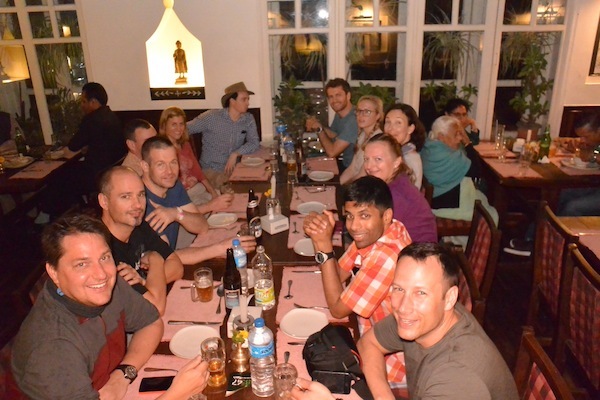 Veterans Day 2013: Team visit to Washington DC to talk about the Significant Event Tracker with our politicians. 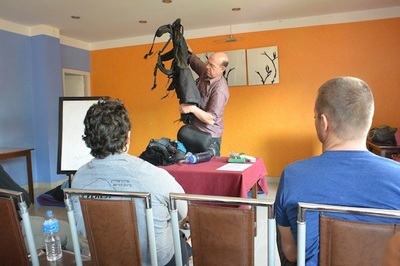 19 Nov 13: Talk at Outdoor Source in Columbus, Oh. 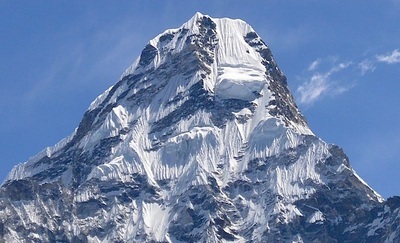 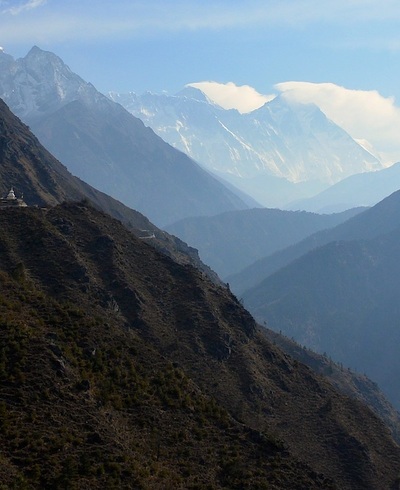 ABOUT THE CLIMB: Mount Everest sits on the border of Nepal and Tibet. 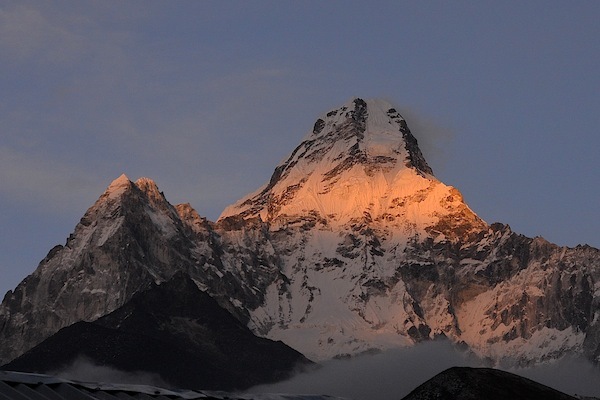 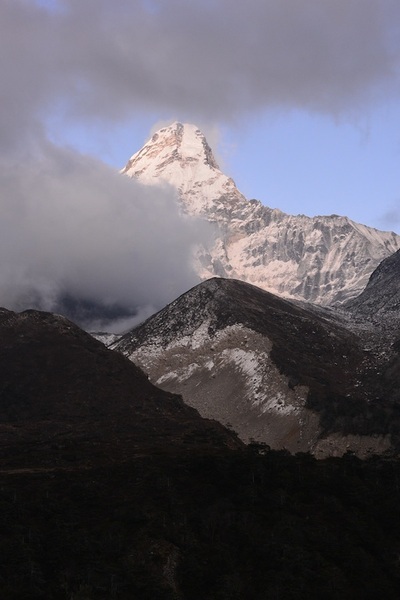 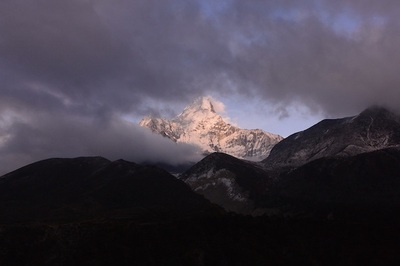 It is the highest mountain in Asia and the world, towering 29,035 feet into the air. 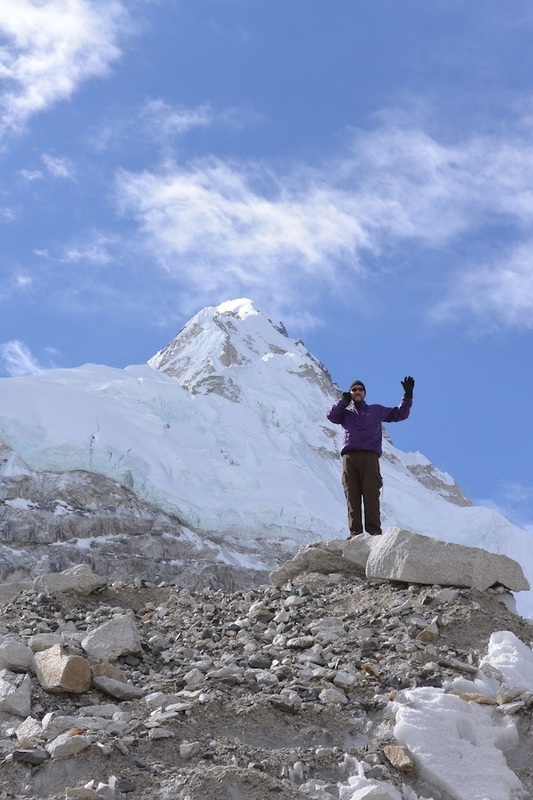 It takes many weeks, even months, to properly acclimate before attempting the summit. I will be on the mountain for 60 days. 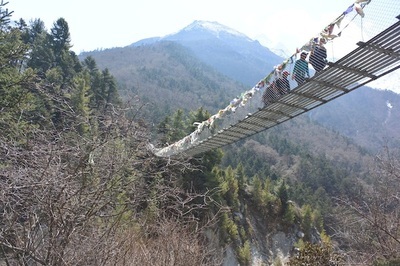 I was suppose to have been climbing via the more technical Northern route from Tibet, however, I have been informed that as am American I will not be allowed into Tibet to climb! 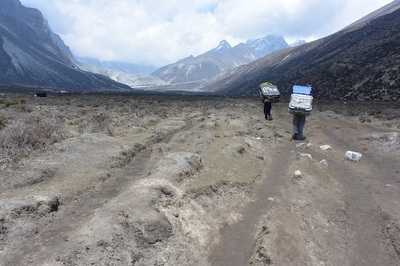 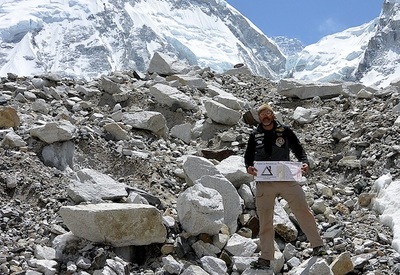 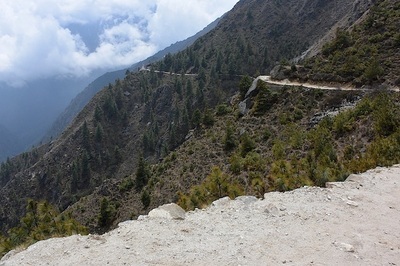 So, I have moved to the standard South Col route from Nepal. The technical trade offs will be instead of the infamous 2nd step on the North, I will have the notorious Khumbu Icefall and the Hillary Step on the Southern route! 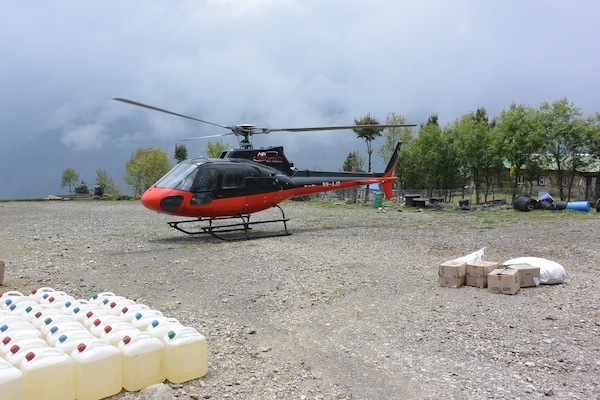 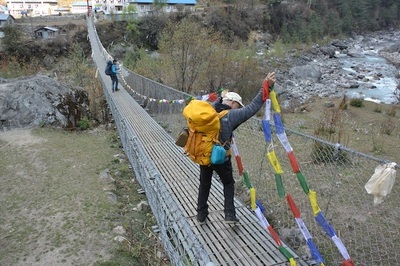 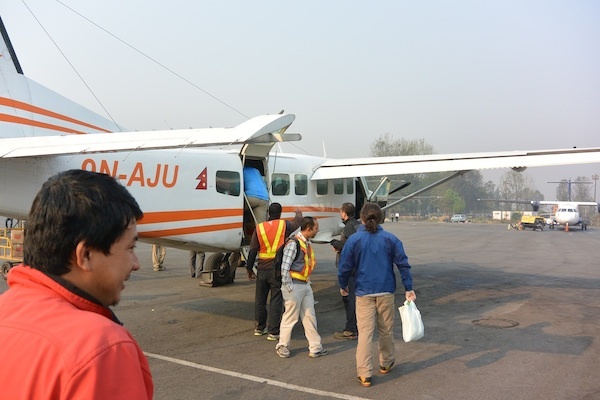 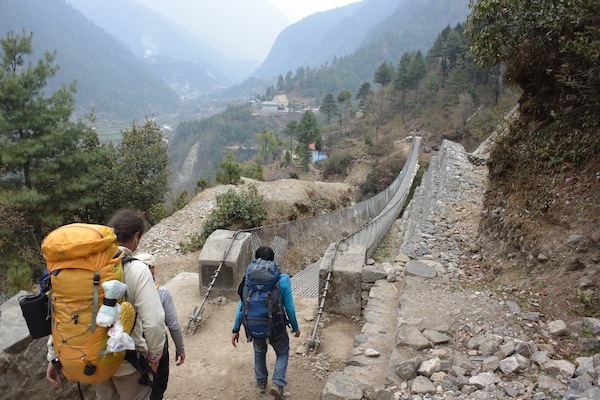 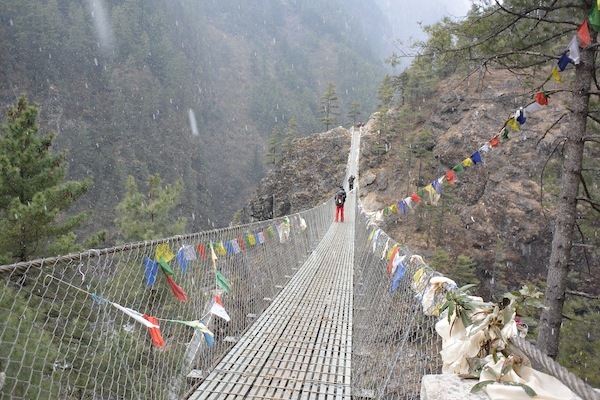 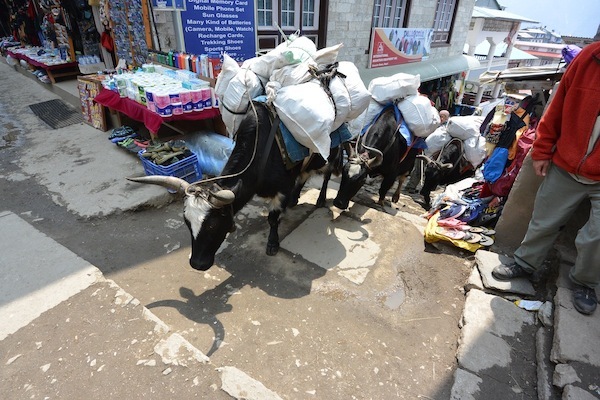 STEP ONE: The trek to Base Camp (BC) starts off with the harrowing flight into Lukla (you should really youtube it!) and will take 9-10 days to trek into BC. This is very important for acclimatization and to prepare us for the higher elevations that await. 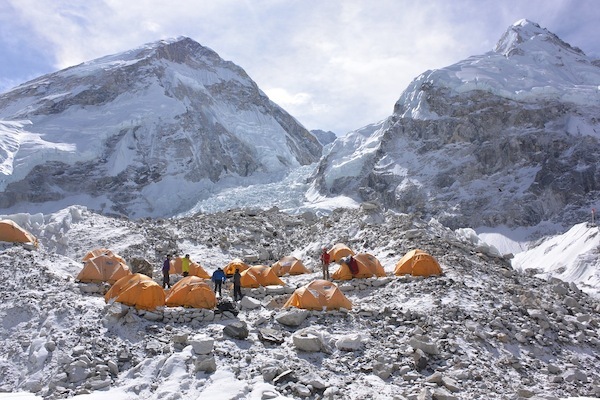 STEP TWO: Acclimating on the Mountain requires about 20 plus days of climbing up to our higher camps and returning to a lower camp to sleep. This is called "Climb High, Sleep Low" and is extremely important to help us physically prepare for our survival on the mountain. 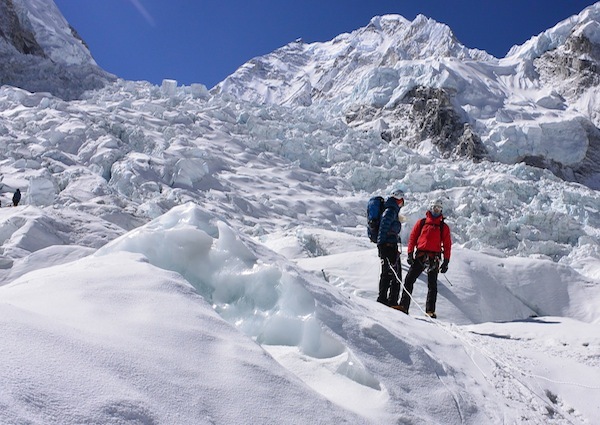 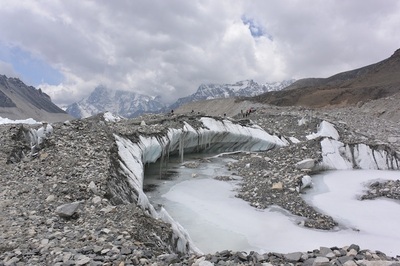 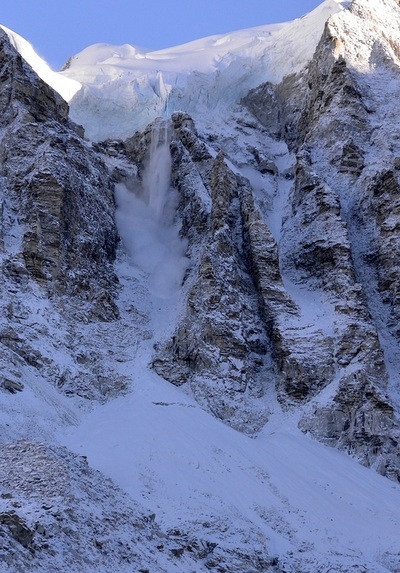 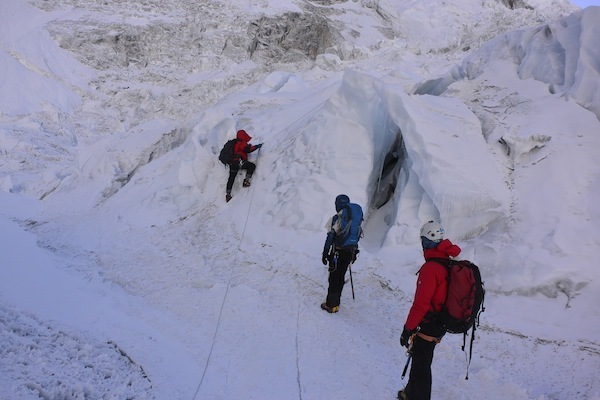 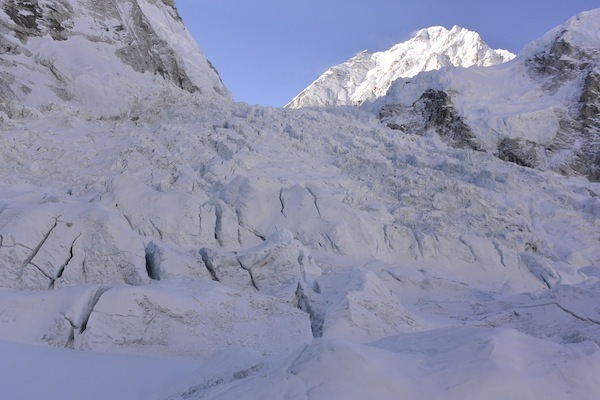 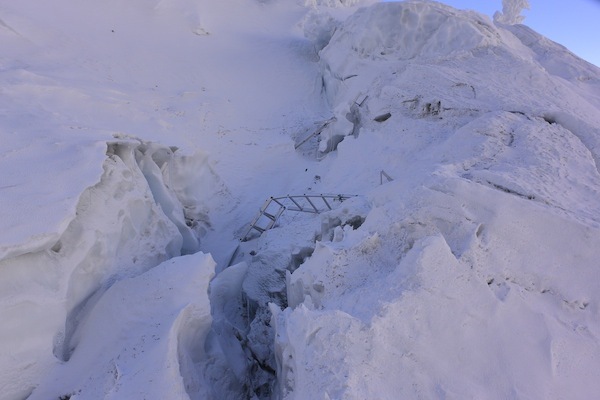 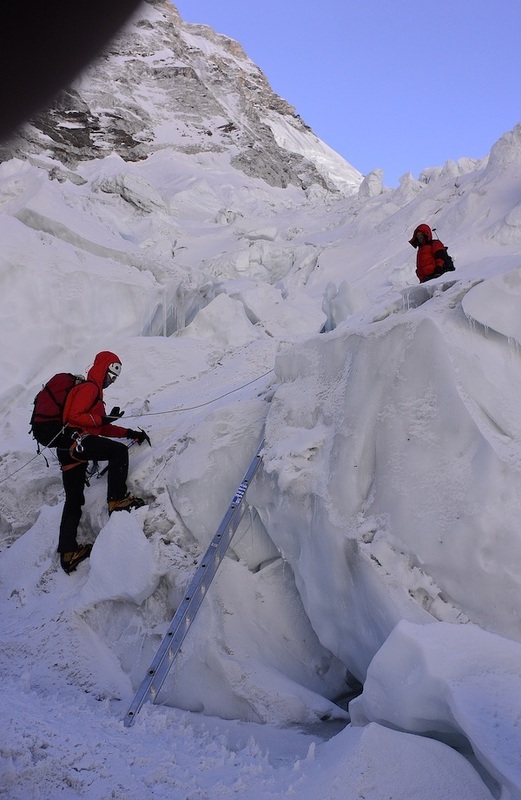 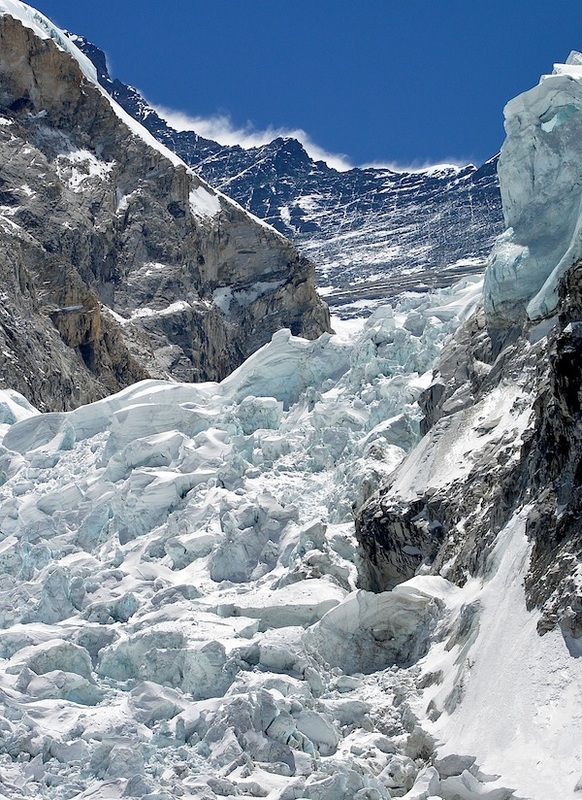 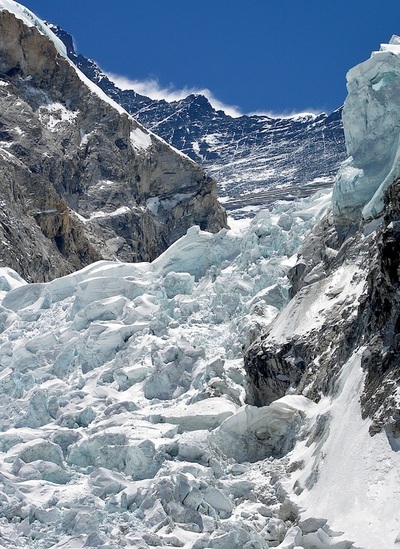 KHUMBU ICEFALL: This is the first major challenge, over 2000ft up jumbled blocks of ice, seracs and crevasses which moves and shifts without notice. This is a place we will go through several times, but a place we must always keep moving. 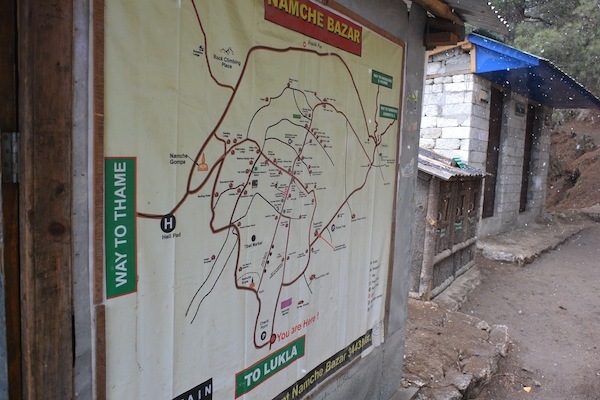 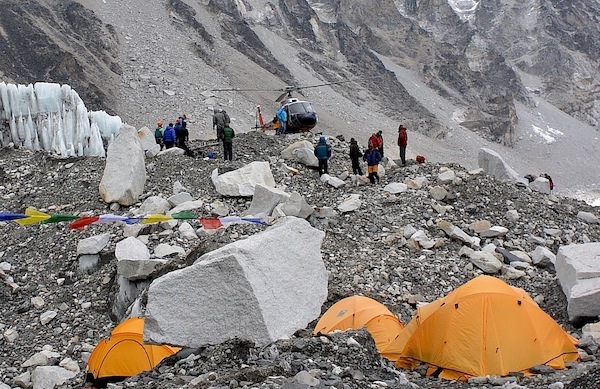 This is where more people are killed than anywhere else on the mountain. 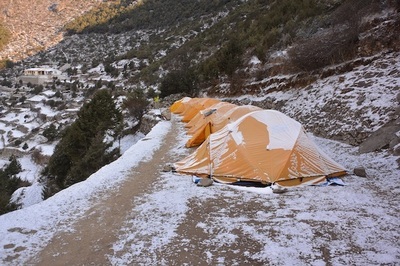 CAMP ONE and CAMP TWO, Western CWM: The Western CWM (pronounced coom) is a bowl surrounded by himalayan giants. 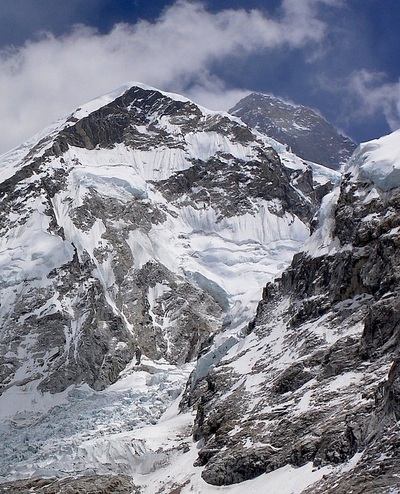 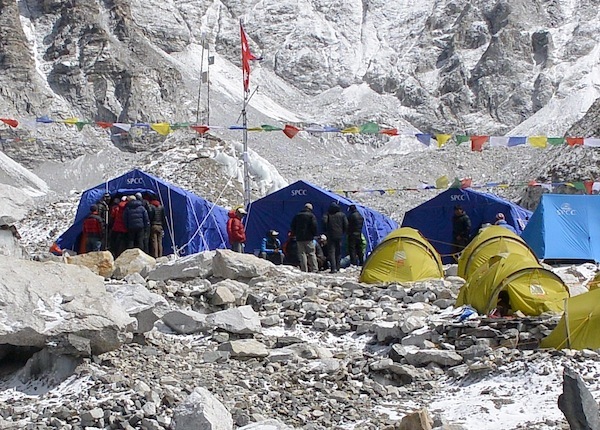 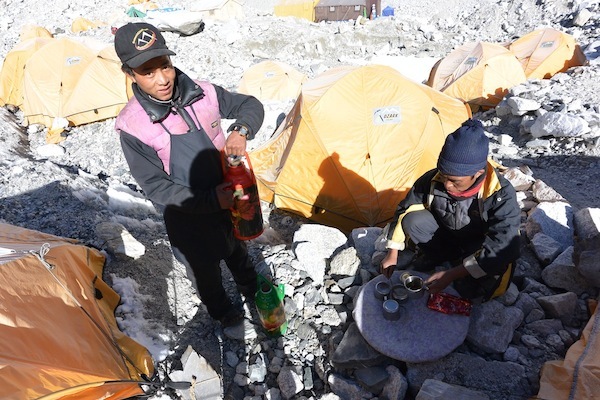 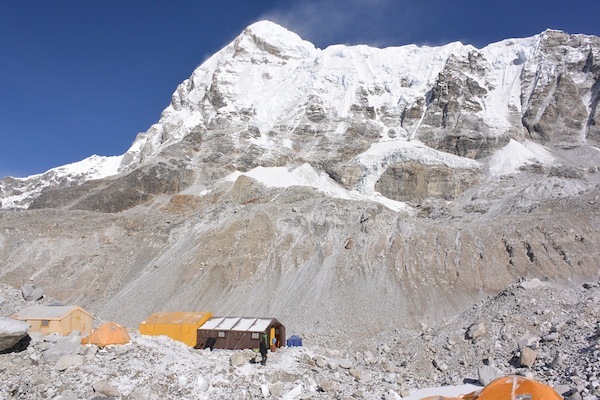 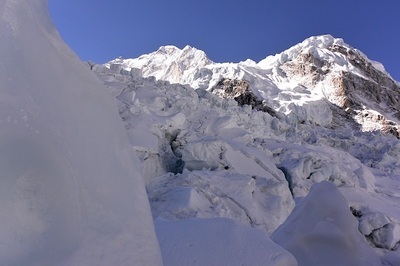 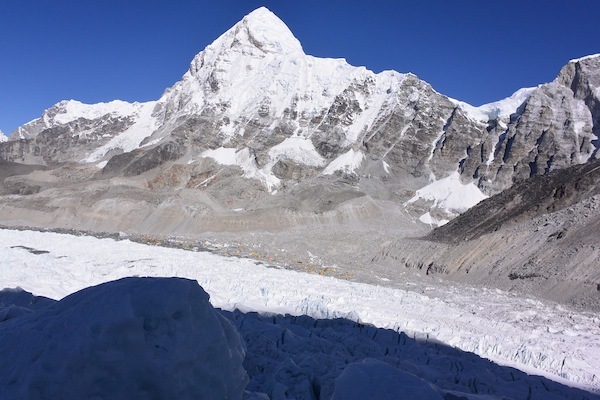 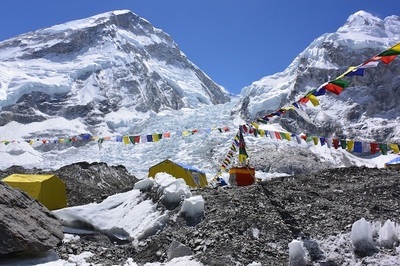 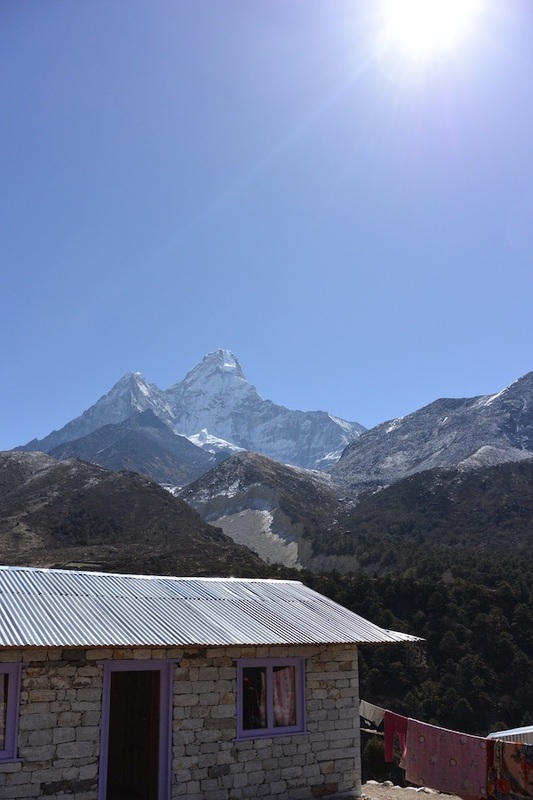 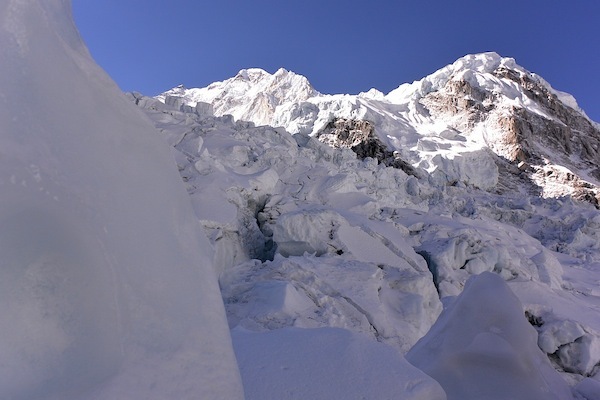 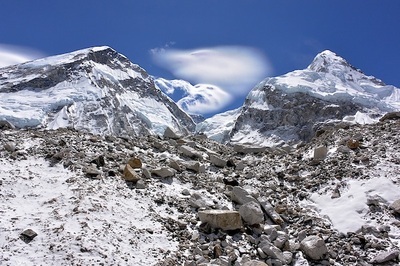 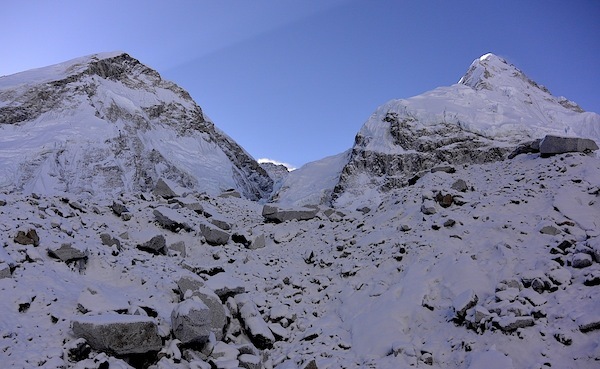 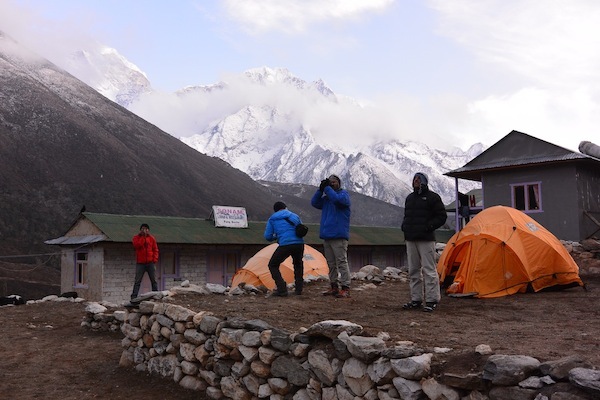 There are 2 camps, Camp One is located above the icefall and Camp Two is located towards the Lhotse face. 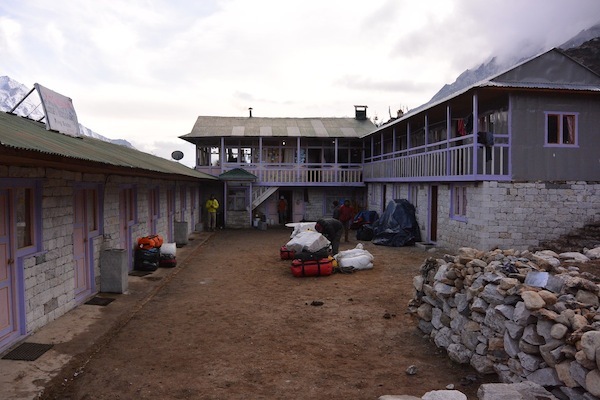 CAMP THREE, LHOTSE FACE: This camp is located on the steep face of Mount Lhotse (the 4th highest mountain in the world). 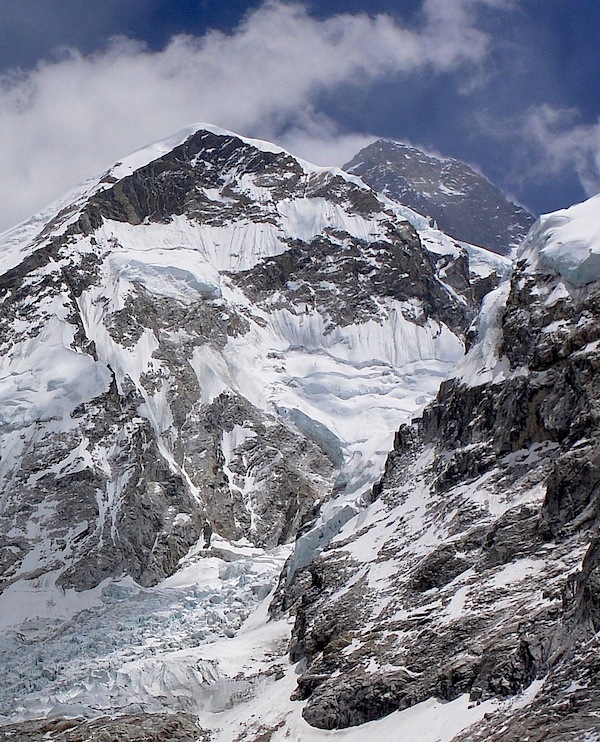 There are fixed lines up this long face, and a place that has recently been know to bottleneck as long strings of climbers head up it. 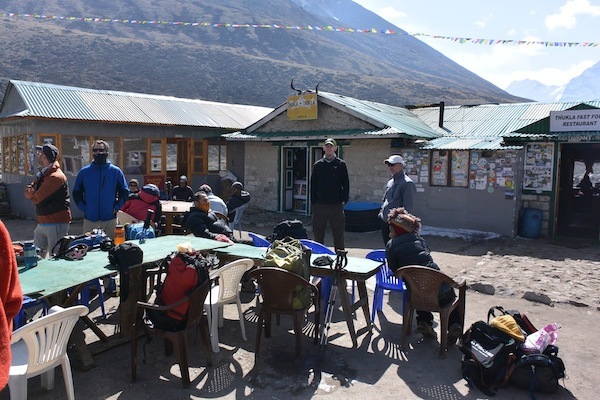 STEP THREE: Summit attempt, which is where we will being moving up the mountain, stopping at each camp for a night before heading to the summit. CAMP FOUR, The South Col: This is the "Death Zone" located at 8000m, and will be our last stop before our Summit Attempt. Discarded camps, o2 bottles and bodies are known to inhabit this "layover" to the top. 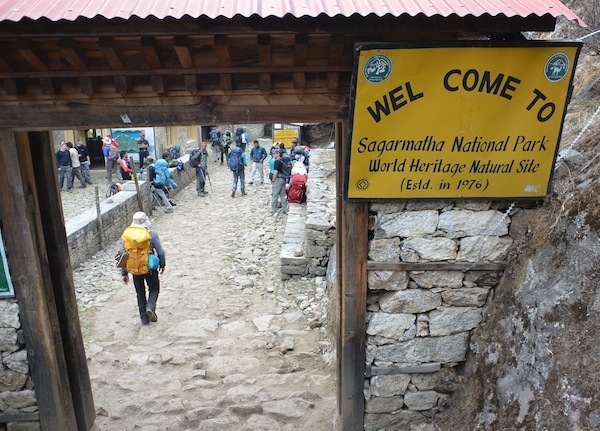 SUMMIT DAY: We will head up to the "Balcony" and then up to the "South Summit" where we will most likely experience a long line in que for the "Hillary Step" (a 40 ft rock climb) after this it is the summit ridge to the top. 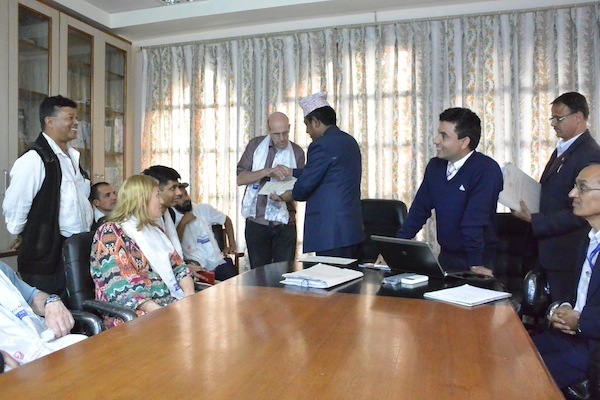 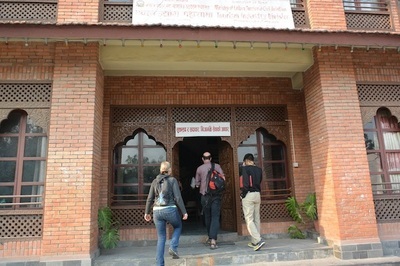 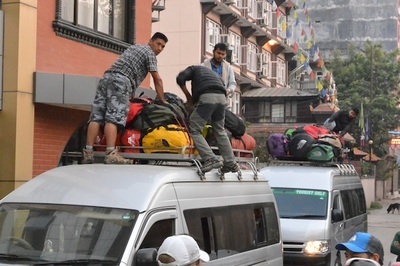 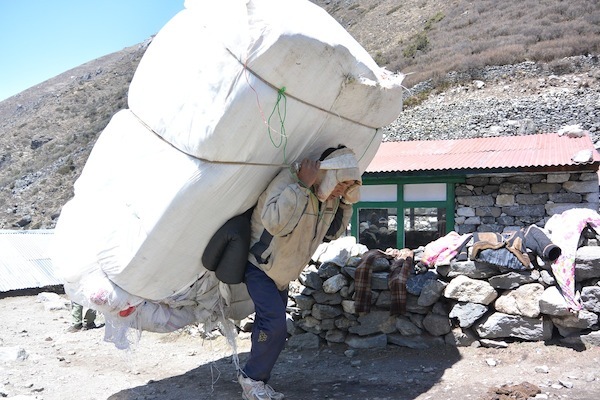 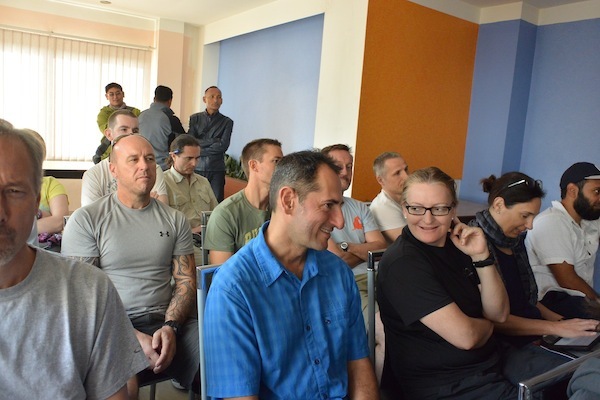 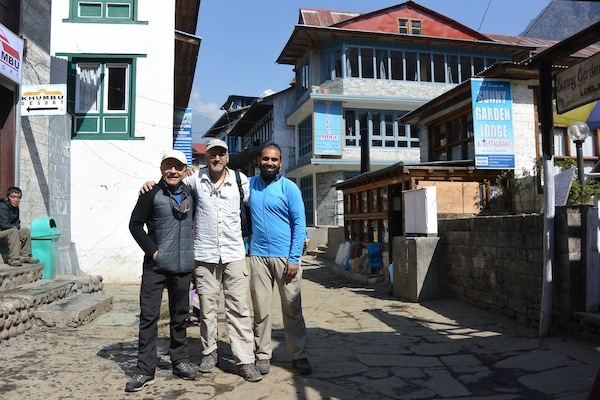 6-9 APR: Kathmandu, Expedition Logistics. 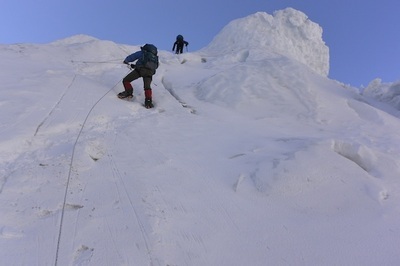 20-27 MAY: Summit Attempt Window, with time to descend and attempt again. 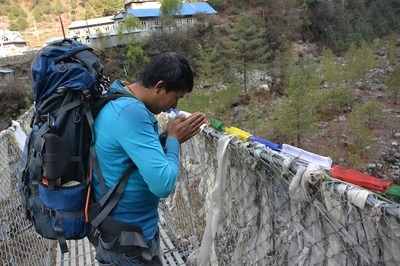 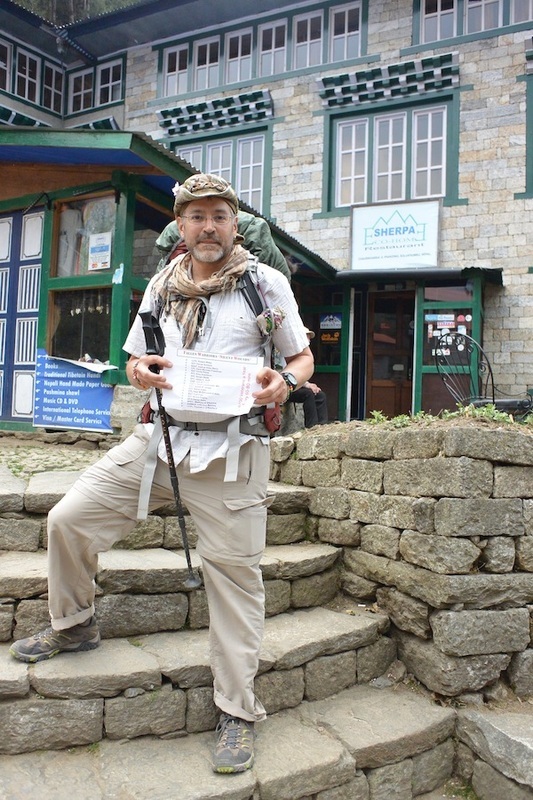 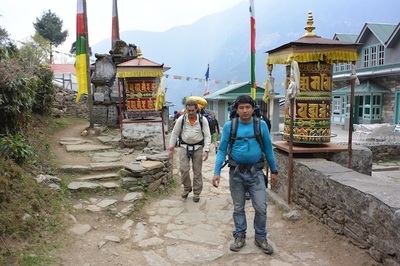 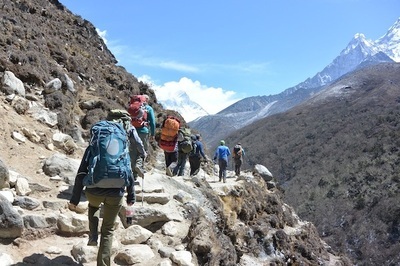 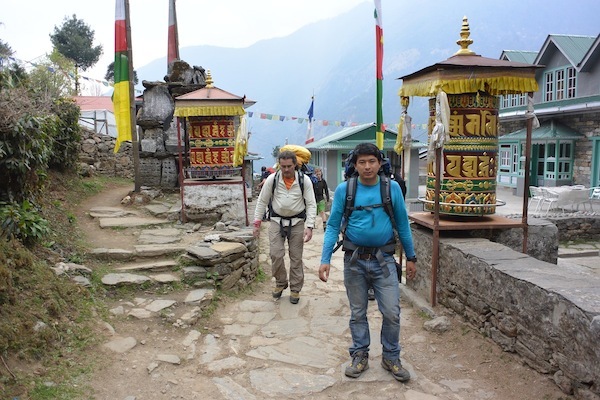 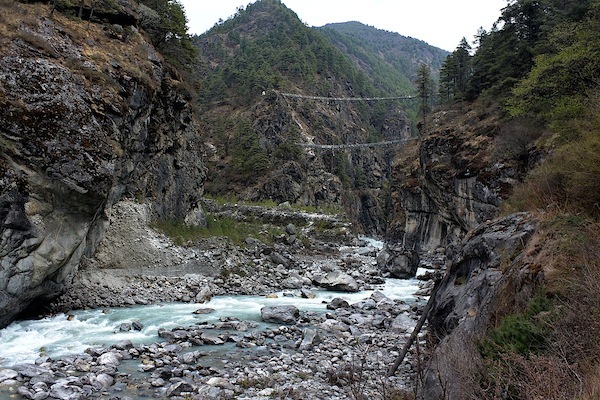 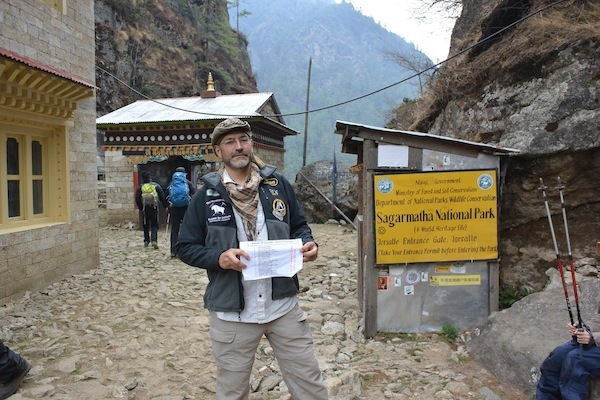 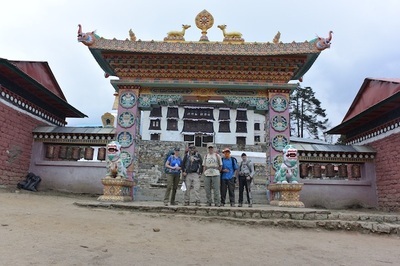 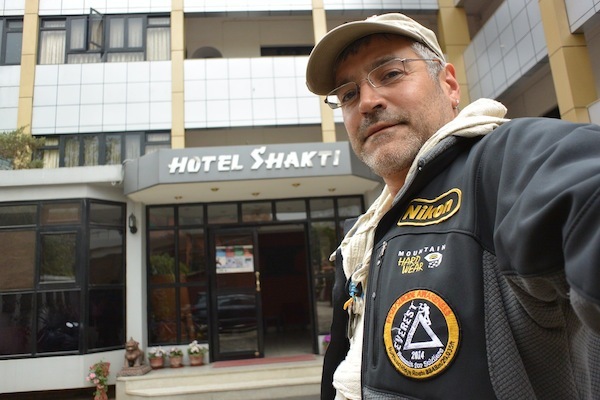 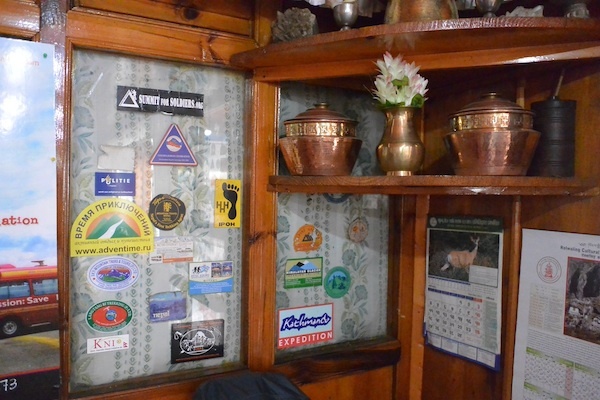 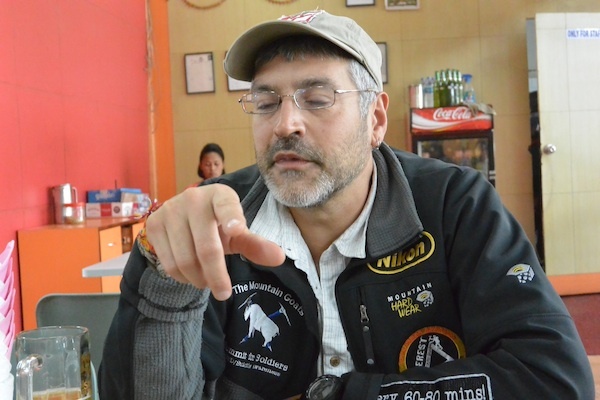 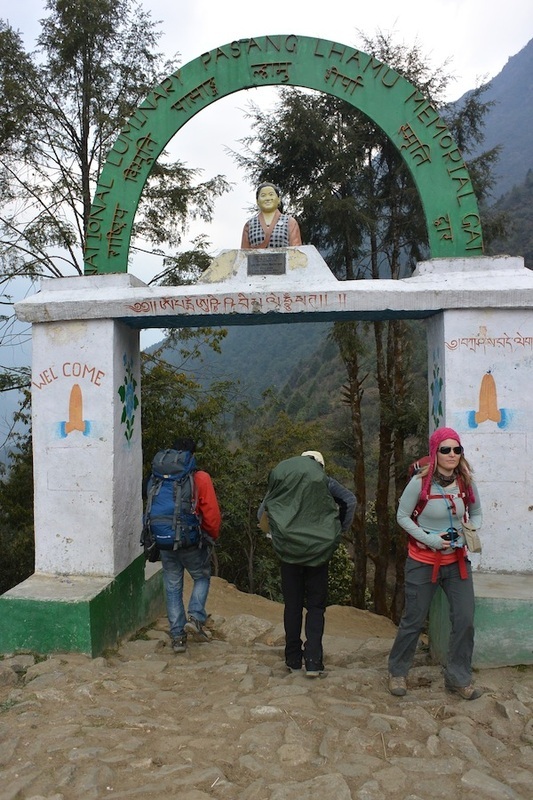 28 MAY - 8 JUN: Trek back to Kathmandu and return to USA.